Hey podcast listeners! 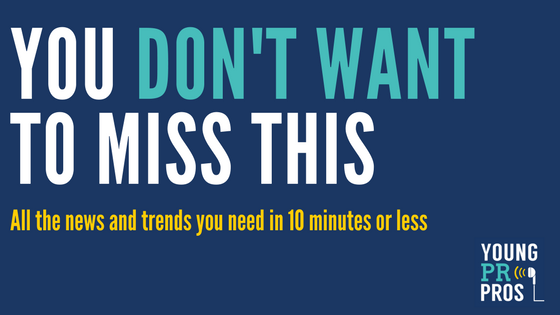 Thanks for taking some time to check out our latest edition of You don’t want to miss this. Every Wednesday, we will feature five articles we think are worth the read in order to keep up with the news and trends in our industry. In the fast-paced environment of communications and public relations, the future can often be unpredictable. So it is up to us – as young professionals – to anticipate and adapt to changes within our industry. Unfortunately, none of us have the power to see into the future, but the five articles that are featured in this week’s edition, will help to demonstrate some of the future trends in business productivity, reaching a target audience, and in technology and social media. The future of workday productivity is now. According to board-certified sleep specialist, Michael Breus, there is a way to distinguish your personal “chronotype”, your body’s natural sleep habits and energy patterns. This article How To Design Your Ideal Workday Based On Your Sleep Habits will help you discover your sleet type so you can do more with your working hours. Millennials. For some reason they have gained a bad reputation for being self-indulged, hard to please, and constantly connected (via social media and instant messaging). Regardless, millennials are the current and future consumers, and they hold significant power because they are one of the largest target audiences for PR firms and advertising agencies. Check out this article, 4 guiding questions for reaching millennials, to ensure your message or product reaches not only this generation, but future generations as well. Have you ever dreamed of starting or owning your own business in the future? This article, Seven Smart Tips For Starting A Small Business In 2018, can help you get started! Everyone knows this process does not happen over night, but with the right research, planning, and decision-making, your future could look quite bright as a businesses owner. The future of media and PR is coming. Will you be prepared? To stay on top of the ever-evolving world of Communications and Public Relations, check out this article The Biggest And Most Important Media And PR Trends For 2018. An excerpt from the article outlines some of the major changes that are happening, “From Artificial Intelligence to Fake News, content marketing to client communications, here’s what the futurists predict for the communications industry.” Find out what is being said about the future of our profession. Social media is of great importance in our field of work. Being aware of future trends and developments in social media is a must! In today’s society, social media permeates news, politics, and overall communication. Notably, the age at which social media are having an impact is becoming younger and younger. Give this article, 11 Ways Social Media Will Evolve in the Future, a read in order to keep up with the shift in social media and to use it to your advantage. That’s all for this week listeners. Thanks for checking out our series! I hope you learned something new and now have the tools to somewhat help you ‘predict’ your future as a professional. Next → Next post: Episode 126: Data or your gut, which should you trust?